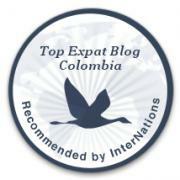 I’ve decided to add a section to the blog devoted exclusively to Bogota’s neighborhoods. In each post I’ll talk about what I like about each neighborhood and what they have to offer. I’m starting off the series with my favorite neighborhood: Quinta Camacho. Quinta Camacho neighborhood: Between Calle 67 and Calle 72, and Carrera 7 and Avenida Caracas. I used to live a couple of block away from Quinta Camacho and I love this little neighborhood. The area is made up mostly of two-storey traditional houses, boutiques, bars, cafés and restaurants, with tree-lined avenues. The streets are quiet compared to other parts of the city, making it a lovely area to walk the dog or go out with kids. It’s located just north of Chapinero, to the west of the chic Rosales neighborhood and to the south of the exclusive El Nogal neighborhood. Although strictly it’s not part of Bogota’s Zona G (Gourmet Zone), it should be, because it has a fabulous selection of restaurants. Quinta Camacho is full of charm. It achieves a balance between being a friendly neighborhood you’d want to live in, without being prohibitively expensive like some of the surrounding neighborhoods. I’d say this is one of the safer areas of Bogota (though like anywhere in the city you should always take a reasonable amount of care). Here are some general safety tips for Bogotá. Ixcacau is a pretty, brightly-colored tea room in Quinta Camacho with an outdoor patio. It’s a nice place to meet friends for a snack or to spend some quiet alone-time with a good book. It’s also a nice place to go for a hot drink after a meal in the area – I love their mandarin, pear and ginger tea. Ixcacau also does light meals such as sandwiches, paninis, salads, soups and quiches. They specialize in French macaroons, of which there are 16 different flavors. I’ve tried their blueberry and a mora macaroons, which was something different! Café Cultor is a specialty coffee shop in Quinta Camacho where the baristas are experts in coffee preparation. There are many different types of Colombia premium Arabica coffee and a whole range of different preparation methods to choose from. As is the case with many of Bogotá’s other specialty coffee shops, Café Cultor works with local farmers, including many who live in former conflict regions of Colombia, and pays them a fair price for their coffee as an incentive not to grow coca (the cocaine derivative). The Casa Café Cultor has its own coffee lab, and the baristas will ask you to choose a blend of coffee to suit your taste. This might be a floral Sierra, a chocolatey Tolima, an acidic Huila or a combination. It has a pretty patio, so it’s nice to sit outside on a sunny day, but it’s cozy to stay inside if it’s raining. This little café also serves specialty coffee and I used to go there often to meet up with friends when I lived in the area. It’s also just a couple of blocks from TransMilenio station Calle 72, so it’s a convenient place to meet if people are traveling there from other parts of the city. The coffee is tasty and they also have some tasty cakes and pastries. It doesn’t have a patio like the other two, but it’s still a nice place to come and read a book or get some work done. This bar has a hint of 1920s Paris. The red and velvet decor in these fully-furnished rooms stretches up three storeys. It’s a venue which seems quite removed from 21st-century Colombia, let alone Quinta Camacho! At this bar, mixology is a fine art, and there’s a masterpiece for every customer. They make the cocktails with organic, locally-sourced ingredients, so drinking one truly is a taste of Colombia! If you’re new in Bogotá, you might not have heard of some of the exotic fruits on the menu. No problem – just tell your server what kinds of fruits, flavors and liquors you normally like and they will mix you up a treat! This bar is hidden away on the second floor above what is currently El Caudillo restaurant. Look out for the cocktail-mixer sign hanging subtly below the roof. This is a very popular option for Asian food in Bogotá with restaurants all over the city. They serve a wide range of very tasty dishes at ‘okay-for-Bogota’ prices. You’ll find Thai, Vietnamese, Cambodian, Chinese and Japanese dishes on the menu. This is also a safe option if you need to cater for vegetarians or vegans, as there are a few good dishes and sushi options to choose from. My favorite are the gyozas (dumplings) in the starters menu! The Wok in Quinta Camacho gets busy at weekend lunch and dinner times and on a holiday Monday. I like sitting upstairs at the bar in front of the chefs and watching as they prepare the food! Abasto has restaurants in the Quinta Camacho and Usaquén neighborhoods, and brings together the ingredients of typical Colombian cuisine and modern gastronomy. We had a kind of mixed tapas dish the last time we went, and the empanadas, chorizo and peppers were fantastic. The service is also friendly and it’s just a nice environment to be in. Probably a good option for a family meal, but also for couples. Walking into El Boliche restaurant is a bit like entering someone’s dining room. This homely restaurant specializes in pasta and Argentine milanesas (breaded meat fillets served with a selection of sauces). Order the Miti-Miti if you’d like to try both and you’ll get a two half portions of your chosen milanesa and pasta dish. My favorite is the Di Melanzane pasta, with an egg-plant, mushroom and tomato sauce. The servings are generous, and I like that they give you the option of ordering a half-portion, as this is normally enough for me. This gastropub is run by an English expat and is a fantastic option for brunch. The Full English Breakfast is amazing, and comes with the works – eggs, bacon, sausages, tomato, mushrooms, potatoes and bread, and delicious homemade baked beans. It’s guaranteed to leave you full for the rest of the day! Their pork sausages are really good, and their Sunday lunch of roast meat, roast potatoes, vegetables and their signature Yorkshire puddings with a generous serving of gravy is also excellent. They have screens often showing Premier League football (soccer) matches at the weekend, and I think they show the rugby sometimes too. One of the best gastronomic experiences I’ve ever had, Takuma won’t only feed you delicious Teppanyaki-style Japanese food, they’ll entertain you too (think ceiling-high flames and Samurai swords!). Ask for the full experience when you go in, and you’ll have your very own grill and chef. Throughout the cooking process they will check how much seasoning and sauce you want, and they’ll also check for allergies. My favorite dish is the Takuma Evolución, a mouth-watering fusion of pork, bacon and pineapple with rice, followed by shrimps in basil sauce. The service is outstanding, and I just loved the complimentary starters and desserts. Javi and me, the stars of our gastronomic show! I haven’t been to El Ciervo y el Oso but I’m mentioning it because I’ve heard others saying great things about it. It follows the common theme in Quinta Camacho of bringing together local ingredients and adding their own innovative twist. The cocktails have great reviews, as does the service. If you’ve been in Bogota for longer than a few days you can’t have not heard of Crepes & Waffles! It’s not difficult to work out what their specialty is – the clue is in the name! As I’m not a fan of savory crepes, I mainly go there for dessert after having my main meal somewhere else. I love their Choco Rochelle ice cream (a bit like Ferrero Rocher) and their ‘Chocolate Light’ ice cream is also surprisingly good! They have a well-stocked salad bar which is good if you fancy a light lunch or if you’re a vegetarian. I’ve heard great things about this bookshop, though I’ve never been! La Esquina Vegetariana on 11 and 69 is a hidden gem. I went for lunch on a weekday and it is super crowded. They had one meal they were serving which was 3 courses and everything was amazing, fresh, and delicious. And the best part is that it only cost something like $12,000. Also Brot Bakery’s chocolate bread. And there are a couple secondhand bookshops my Colombian friends like (I have only been to the one on 11 and 68.) and it is a dig through shelves and boxes type but all the books are cheap. Treasure hunt if you like that sort of thing. Gracias por la info !! es un barrio hermoso ! !